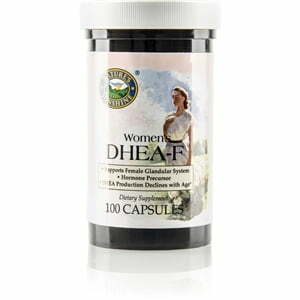 Nature’s Sunshine DHEA-F (for females) combines DHEA with a base of herbs that include wild yam, false unicorn, and chaste tree. Produced by the adrenal glands as a hormone precursor, dehydroepiandrosterone, or DHEA, eventually turns into hormones essential to bodily functions. As time passes, the adrenal glands produce less DHEA which may play a role in the body’s aging processes. The herbs in the herbal base help the female body remain balanced. Instructions: For adults: Take one capsule daily with a meal, or as directed by your health care provider following DHEA level assessment. Cellulose (plant fiber), gelatin and water.